6 of the Best Wooden Toys for a Natural Baby Registry. I've spent a lot more time than I care to own up to building my baby girl's registry. Some of the searching started before we even started trying and then I started a private registry to remember things as I came across them in the few years we spent waiting and praying for our miracle. But, this made piecing together my public registry pretty easy since I already knew the type of items I wanted to stock our home with for the future Owens'. My top priority when building my registry is finding safe, all-natural products that our babies can put in their mouth (since that's the first place everything goes) and not have to worry about the toxins they might be ingesting. Some pieces are more important than others (to me) to be organic, etc. But, when it comes to toys, that is non-negotiable for me because that's one thing I know for sure will end up in their mouths constantly. 1. Heart Baby Wooden Puzzle from Bella Luna Toys ≫≫ This toy is not only a great brain game for baby, but it's pretty to look at and has multiple uses (doesn't have to be used as a puzzle). I love that it is complicated enough to grow with baby for awhile, but the pieces are all large enough for the tiniest of babes to play with. 2. Personalized Name Block Wooden Toy by Little Sappling Toys ≫≫ I know I'm still being a tease with baby girl's name, but I love it so much I want to put it on everything! 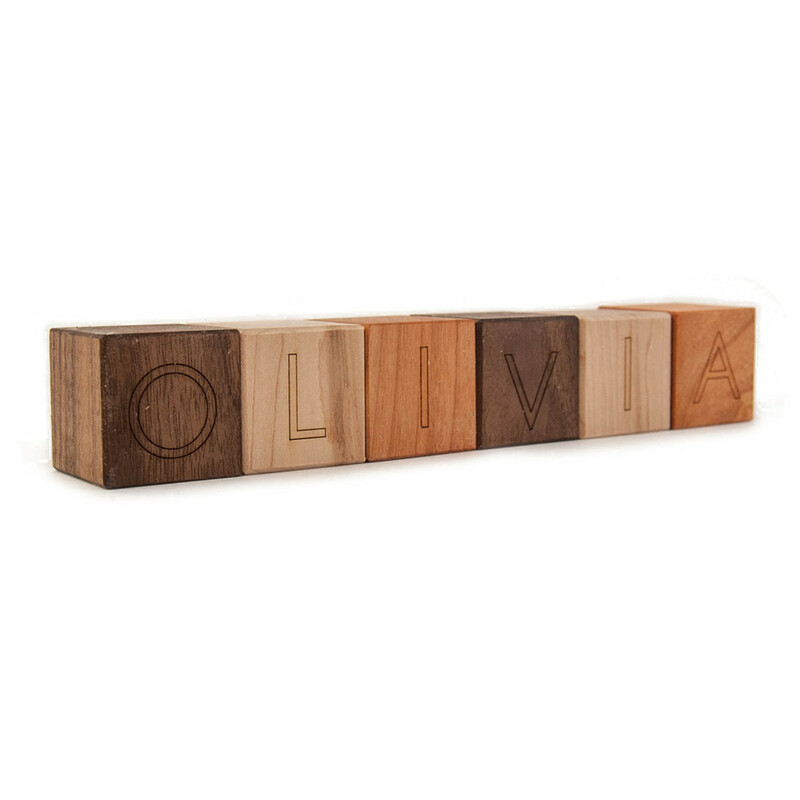 These personalized blocks are so cute and still safe for baby to use for their buildings. 3. Wooden Cakes and Biscuits from BeeSmart ≫≫ I'm obsessed with the vintage look of these toys. If anyone knows where to find more vintage looking toys (wooden or not) that are safe for children (aka- not actually vintage and use lead based paint, etc)...please let me know! 4. Wooden and Crochet Hedgehog Teether and Rattle ≫≫ Baby can shake and teeth on this natural wooden rattle and teether all day and night. I like having a few neutral items in babies toy bin amidst all the pink and bright colors. We have several rings like this to tie onto her "paci" clips (that were never used for paci's) so she can chew and play without losing them. 5. Colorful Wooden Toy ≫≫ I'm not sure what to call this thing, but Iris loves it. It moves around in infinite directions and it's fun for her to try and figure out. I saw it at Barnes and Noble when I was pregnant and knew I had to have it, added it to my Amazon registry and Iris received it for her first Christmas. I love modern momming. 6. Melissa and Doug Wooden Sorting Cube ≫≫ Another brain game for baby that will grow with them for awhile as they learn it's ins and outs. Iris loves her sorting cube and it keeps her engaged for longer than a lot of toys. If you know another great place to find wooden (or other natural and affordable) toys, let me know in the comments! What was/is your baby's favorite toy?